There is indeed a 100% guaranteed safe way to own gold and silver. But before addressing how, a basic question must first be addressed: Why Own Gold? 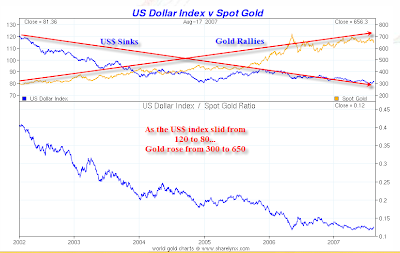 The following chart shows a general tendency (at least since about 2000) for gold to move in the opposite direction of the US dollar. The above chart courtesy of Sharelynx Gold. Yes the dollar has been sinking. But because of inflation the value of all currencies has been sinking. In 1970 a loaf of bread cost a quarter. What does it cost now? Gasoline was $.30 or so then. It is over $3.00 now. This is not unique to the dollar. The price of things has been rising nearly everywhere in every currency. All fiat currencies eventually go to zero, the only difference is the speed at which purchasing power declines. Gold has never gone to zero and never will either. 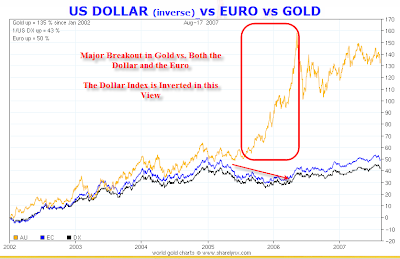 While gold tends to follow an inverse of the US dollar, it can also disconnect against the dollar and the Euro as this chart shows. The above chart, courtesy of Sharelynx Gold, shows the percentage move of gold (AU) vs. the inverse of the US dollar index (DX) vs. the Euro (EC). While the Euro and Dollar stayed inversely related, gold made a major move against both currencies. If gold can do that once, it can and likely will do that again. The US keeps spending money it does not have attempting to be the world's policeman. And politicians keep making promises and adding to the national debt. This is financially destabilizing. It makes sense to have some assets outside the conventional thinking of the financial touts on CNBC who generally only recommend one of two things (stocks or bonds). Gold has been acting well over the last seven years and deserves a spot in a diversified portfolio. Gold typically performs well in times of geopolitical stress and certainly the US has made a lot of enemies recently with the invasion of Iraq. We are threatening Iran right now. In addition both Saudi Arabia and Pakistan are not the most stable of countries. If the Mideast blows up or oil is shutoff, gold is likely to perform very well. Safe havens are under appreciated until one needs them. There is increasing interest in gold and silver as an investment class. But there is tremendous room for more. The mainstream media still wants little to do with gold or silver. But that's actually a good thing. Remember what happened in 2000 after everyone fell in love with tech stocks? Remember what happened in 2005 when people were camping out overnight to buy Florida condos? The time to buy asset classes is when they are just being discovered and still unloved by most. The discovery process is just now happening in gold and silver. Some think that Bernanke is going to print his way out of the next recession. Money will be flying everywhere. Prices of everything will soar and the only way to protect themselves is with hard assets like gold and silver. I do not subscribe to that view. I think deflation is coming. My reason is that so much credit has been extended on houses and boats etc, and there is no way to pay back what has been borrowed. We can certainly see a massive rise in foreclosures and rapidly dropping home prices as well. Bankruptcies are a destruction of credit (elimination of debt), and when people lose jobs in the upcoming recession bankruptcies will soar. Bernanke will no doubt cut interest rates in response. There is a chance, even if only a very small one that hyperinflation takes hold. On that chance, it's smart to have a certain percentage of assets in gold. Consider gold as an insurance policy. Deflation is the other end of the spectrum. For reasons outlined above I think that's where we are headed. Gold has done very well historically in deflation. Think of the great depression. Who didn't want gold coins? The purchasing power of gold soared in the depression. But isn't this contradictory? Can gold rise in all situations? The answer is that it's not contradictory because gold does not do well in all situations. Gold does poorly in "normal times". In normal times stocks and bonds are the place to be, not gold. Gold does well at the extremes, very well in fact. Hyperinflation and deflation are the extremes. Once again consider it an insurance policy, and one likely to be needed one way or another as well. Bankruptcies and rising unemployment with a consumer led recession is all that it may take to set thing off. I believe a severe consumer led recession is coming. With that recession, rising unemployment is a given. Once again consider gold as an insurance policy. I think it will be needed. 9) Gold, unlike the US dollar is not a claim on anyone else's liability. A fiat dollar is merely a claim on resources, and it is a liability of the Fed (while its government bond holdings are its assets). Gold is gold. It is not anyone else's liability. This is also why gold is the ultimate form of payment when everything else fails. One does not need to trust anyone when taking gold in payment. Whereas with all other financial assets you need some counterparty to perform. Note that the dollar used to be a claim on gold or silver (but even that's not true anymore). The following images show how it used to be. Right beneath "Silver Certificate" is the text "This Certifies There Is On Deposit In The Treasury Of The United States Of America One Silver Dollar Payable To The Bearer On Demand". Notice how the text reads there is one dollar in silver backing up that paper dollar. Now there is zero silver and zero gold backing up that dollar. Take a look at the 1928 $20 Gold on Demand Note. This series of $20 notes displays the phrase "Redeemable in Gold on Demand at the United States Treasury, or in Gold or Lawful Money at Any Federal Reserve Bank". Take out a dollar bill now and look at it. What you will find is this statement "This Note Is Legal Tender For All Debts, Public and Private." Dollars are no longer backed by gold or silver or anything in fact. They can be printed at will by the treasury. Money (credit really - since nothing is backing it) can also be borrowed into existence by various lending institutions like Fannie Mae. Now consider Constitution, Article I, Section 10, Clause 1. No State shall…coin Money; emit Bills of Credit; make any Thing but gold and silver Coin a Tender in Payment of Debt. Those interested in further discussion about gold and silver in the constitution might be interested in reading Honest Money by Douglas V. Gnazzo. 10) Gold is Money. How do we know that gold is money? The short answer is because it acts like it. The long answer can be found in Misconceptions about Gold and Why does fiat money seemingly work? 1) Gold does not pay interest. 1A) That's true. And stocks don't either although bonds, CDs, and money market accounts do. But remember the top two reasons to own gold were as a hedge against the dollar and to protect against global currency debasement. If the dollar falls in value by 10%, those making at 5% interest are losing wealth. 2) Gold does not pay a dividend. 2A) That's also true. But bonds don't pay dividends either. And the Dividend yield of the S&P is a mere 1.4%. Yes one can find higher yielding stocks, but those tend to be much riskier. New Century Finance was paying dividends in the teens before it went bankrupt a few months ago. With the possible exception of 1929 and the dotcom bubble of 2000, stocks have never been as risky as they are now. 3A) Typically the above statement is made in passing as if other things are not risky. But step back for a moment consider the debacle in housing. Some houses in bubble areas like Florida, Las Vegas, California, Boston, and DC are down 25-40% (condos even more). Remember how everyone thought housing prices only go up. It was true for so long that virtually everyone believed it. The models at Moody's, the S&P, and Fitch all counted on it. But over 130 mortgage lenders have now gone bust because of failed models. Housing prices dropped for the first time since the great depression and are going to drop again, perhaps for another five more years, or more. One look at the swings in the stock market lately should be enough to convince anyone that the market is hardly risk free. A dozen hedge funds have now blown up with two prominent funds at Bear Stearns falling to zero (worthless). Can stocks fall again like they did in 2000? Of course they can. Most people still do not realize how unusual the period from 1995 to 2000 was. Everything worked, until it didn't. It was a once in a lifetime opportunity to get in on a meteoric trend. An echo bubble occurred when Greenspan cut interest rates to 1% in the wake of the dotcom crash. Housing took off, jobs were plentiful, and corporations made money hand over fist selling junk bonds to investors. The echo bubble is now over and the economy appears to be slipping into a recession. But just because stocks are risky does not mean gold is necessarily safe in every form. Then again it's important to remember that reason number 4 to own gold was "Portfolio Diversification", and reason number 5 to own gold was to have "A Safe Haven From Geopolitical Instability". But for those who want to eliminate as much risk as possible there is a perfectly safe way to own gold and silver. By perfectly safe I mean government guaranteed principle with no downside risk regardless of what happens to the price of gold or silver. EverBank® is offering a MarketSafe® CD in gold, a new and completely safe way to invest in Gold, where yields are driven by the average spot price of gold bullion, and deposited principal is never subject to market risk. The next Funding Date for Gold CDs is September 11. They will be offered again in October (most likely the third week). Money needs to be at Everbank by the Funding Date. Click Here to Learn More about MarketSafe Gold. EverBank® is offering a MarketSafe® CD in silver, a new and completely safe way to invest in Silver where yields are driven by the average spot price of silver bullion, and deposited principal is never subject to market risk. EverBank® is offering a MarketSafe® CD in silver —where yields are driven by the average spot price of silver bullion, and deposited principal is never subject to market risk. If the Spot Price of Silver has increased in value over the term of the CD, you earn a Market Upside Payment equal to 100% of the percentage change in the average Spot Price of Silver, calculated as an average of ten semiannual pricing dates. If the Spot Price of Silver has decreased in value, you will receive 100% of your principal at maturity. The next Funding Date for Silver CDs is September 11. Click Here to Learn More about MarketSafe Silver. For those who would like to own gold or silver as a hedge, for portfolio diversification, or for any of the 10 reasons listed earlier, but do not want any downside risk, there is no better way that I know to achieve that goal. These programs are aimed at investors with a 5 year time horizon who do not want any risk to principle. In return for the guaranteed principle offered by these MarketSafe® products, the tradeoff is the inability to attempt to time the market. For those whose primary concern is protection of principle this is a great product. Those desiring to diversify their portfolio with gold and silver and are willing to assume more risk can do so with an EverBank Metals Select Account. A less expensive way to own gold or silver—your purchased metal is "pooled" with other investors, saving you from paying storage or maintenance fees. Directly own gold or silver bars and coins with this storage option, which incurs a custodial fee. Both options allow the buying or selling of bullion within 1% of the following day’s a.m. fixing price on the London Bullion Market Association. This is lower than the typical 4-7% commission charged by metals brokers and/or dealers. Click Here For More Information About Opening an EverBank Metals Select Account. How Safe is Everbank Itself? Following are recent statements from Frank Trotter, Executive Vice President of Everbank, in regards to questions I asked about mortgages and the overall safety of deposits at Everbank. Everbank does not originate or own sub-prime mortgages. And as a private company, EverBank is not subject to analysis by the public rating agencies like Standard & Poors or Fitch. However, EverBank has strong rankings from Weiss Ratings and IDC Financial Publishing and of course all deposits are FDIC insured. In light of recent negative news reports surrounding the big three rating companies, we are proud of our safety rankings by truly independent rating agencies. Following is a statement made in today's Daily Pfennig also by Frank Trotter. EverBank is a diversified financial services company engaged in retail and commercial banking, investments, and the production and servicing of mortgages. We have a balanced revenue stream that does not depend either solely or substantially on any one line of business. EverBank is in a strong capital and liquidity position. Results through second quarter this year include an ROE of 16%, and a capital raise in June that enhanced our already strongly capitalized position. EverBank does not originate or own sub-prime mortgages. EverBank is rated "Green Three Star" by Veribanc, and "Superior" by IDC. It has been and is the practice of EverBank not to seek additional return by taking on substantial credit risk; we have a conservative portfolio and are proud of the performance history of our high quality assets. I do own some physical gold as well as a basket of junior miners. But inquiring minds are probably more interested in this question: "What's in this for you?" The answer is a minimal amount per account and/or a slightly different arrangement that has actually yet to be negotiated. In other words, I don't know precisely. It is indeed something, but I'm sure not likely to get rich off it. But if I did not believe in these products I would not be doing this post. Those investing in MarketSafe products do not really "own" gold or silver per se, but rather benefit from any upside moves in the metals, without having the downside risk. The principle is government guaranteed as stated before. MarketSafe® CDs are certainly not for everyone, but they are right for some. Likewise owning physical gold straight up is not right for everyone but it too is right for some. Some prefer owning major gold mining companies like Goldcorp (GC), Newmont Mining (NEM) or Barrick (ABX) while still others prefer owning junior miners or explorers. Individuals have to decide if and how they want to own gold, and what their time horizon and safety preferences are. With that in mind, I am pleased to be able to spread information about these new products as well as stating the case for gold in general. As a disbeliever in both the Fed and fiat currencies I am and have been actively promoting gold. I am hoping the 10 reasons I listed above for owning gold speak for themselves.